Finished the 2015-16 season as the Checkers’ all-time leader in wins (63) and games played (125) … Tied for first in Checkers history with seven shutouts … His 2.57 goals-against average and .916 save percentage were second-best among Checkers goalies with at least 20 games played (Justin Peters) … Set a Checkers single-season record for wins (27) in 2013-14. Completed his fifth professional season, having played for the Checkers in at least part of all five … Spent the entire season in the AHL for the second consecutive season, splitting the campaign between Texas and Charlotte … Made his Texas debut with a 33-save victory vs. SA (10/10) … Made a season-high 43 saves in an overtime loss at MIL (10/27), improving his record to 3-0-1 in his first four games of the season … Appeared in five consecutive games for the Stars from 12/8-12/17 … Stopped 26 of 27 shots vs. SD (12/31) to improve to 9-3-1 on the season … Appeared in just two games during the months of January and February, both overtime losses, on 1/2 (STK) and 1/5 (ONT) … Reacquired by Charlotte on the day of the NHL trade deadline (2/29) in exchange for future considerations … Made his Checkers season debut vs. GR (3/4), stopping all 12 shots he faced in relief of Daniel Altshuller … Stopped all three shootout attempts to secure a 3-2 win vs. CHI (3/8) … Named AHL Player of the Week for the third time in his career after going 4-0-0 with a 1.72 goals-against average and .920 save percentage for the period ending 3/13 … Stopped 29 of 30 shots and all four in the shootout to earn a 2-1 win at MIL (3/18) … Won five consecutive starts from 3/8-3/18 and was 7-1-1 from 3/8-3/26 … Made 29 saves in a 2-1 win at MIL (3/18) … Made 31 saves in regulation and stopped 11 of 13 in the shootout as the Checkers fell 2-1 at RFD (3/20) … Appeared in 18 of a possible 21 games after joining the team. Completed his fourth professional season, fourth with the Checkers and first spent entirely at the AHL level … His 2.68 goals-against average and .916 save percentage in 29 games played were his best totals since his 15-game rookie season in 2011-12 … After winning just two of 12 decisions to start the season, won eight of his last 12 … Stopped 26 of 28 shots to win his first game of the season vs. NOR (11/18) … Lost in overtime despite making a career-high 47 saves on 50 shots vs. NOR (12/2) … Lost in overtime despite making 38 saves on 40 shots at OKC (12/28) … Made 36 saves in a 4-1 win vs. TOR (1/16) … Stopped 39 of 40 shots in a 2-1 win at LE (2/10) … Earned his second consecutive win by making 46 saves vs. NOR (2/16) … Pushed his personal winning streak to a season-best three games by stopping 33 of 35 vs. IA (2/19) … Took a 4-1 loss despite saving a penalty-shot attempt by William Nylander at TOR (2/25) … Stopped 29 of 30 shots in a 2-1 win at OKC (3/14) … Made 28 saves to help the Checkers defeat OKC by a 2-1 score (4/3). Completed his third professional season and third split between the Checkers and teams in the ECHL … Went 27-18-0 to set a club record for most wins in a single season. None of the other eight goaltenders the team used during the season won more than four … Had four separate winning streaks lasting five or more games … Tied for fourth in AHL victories and ranked fifth with 1,305 saves … Tied for third in the AHL with a career-high five shutouts … Went 4-for-4 in the shootout, stopping 16 of 20 shots … Began the season on an ECHL deal with Fort Wayne but only played one game before joining the Checkers on a professional tryout contract on 10/23 … Stopped all 30 shots he faced to earn the shutout in his AHL season debut at GR (10/25) … Made 27 saves to earn his second shutout in as many games at CHI (10/27) … Named the AHL's Player of the Week for the period ending 10/27 by stopping all 57 shots he faced in two starts … Shutout streak of 154:03 ended upon allowing his first AHL goal of the season in the second period of a 35-save victory at RFD (10/31). It was a team record at the time … Broke a personal five-game losing streak and the team's seven-game losing streak by stopping 21 of 23 shots vs. RFD (11/23) … Tied a franchise record held by teammate Mike Murphy by winning six consecutive games from 11/30-12/19, posting a 2.16 goals-against average and .930 save percentage during that time … Made 36 saves in regulation and overtime and stopped three of four in the shootout to earn the win over Norfolk (1/19) … Earned his third shutout of the season with 31 saves in a 4-0 win vs. OKC (1/23) … Stopped 26 of 29 shots vs. OKC (1/24) to win his fifth consecutive start … Left the 2/18 game vs. Norfolk due to injury but still recorded the win by stopping 27 of 28 shots in 46:20 of game action … Returned from a six-game injury absence and stopped 35 of 39 shots in regulation and overtime and four of five in the shootout to pick up the win at SA (3/7) … Made 35 saves against Lake Erie (3/15) to post his third winning streak of five or more games this season … Set a new club record with his 23rd win of the season by stopping 24 of 25 shots at IA (3/25) ... Recorded his fourth shutout of the season (22 saves) to win the second of back-to-back games at IA (3/26) ... Made 32 saves in regulation and overtime and stopped five of six in the shootout to defeat OKC 3-2 (3/29) … After entering the game in relief of Mike Murphy and with the Checkers trailing 4-2 in the second period, stopped all 27 shots he faced in regulation and overtime and four of five in the shootout as the Checkers came back to defeat OKC 5-4 on 3/30. 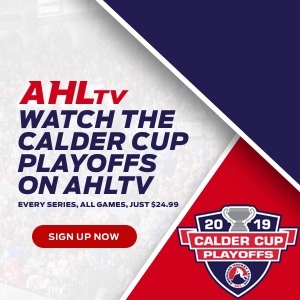 The win gave Muse victories in five consecutive starts … Became one of two players (Bridgeport's Ryan Strome) to earn multiple AHL Player of the Week awards this season by going 4-0-0 with a 0.81 goals-against average and .972 save percentage for the period ending 3/30 … Went 9-1-0 with a 2.05 goals-against average and .938 save percentage in March … Won 23 of 29 decisions between 11/30 and 3/30 … Picked up his fifth shutout of the season and tied Justin Peters for the most in team history (seven) with 30 saves vs. GR (4/10) … Played in 17 of the Checkers' final 20 games from 3/7-4/19. Completed his first professional season and first with the Checkers, splitting the season between Charlotte and the ECHL Florida Everblades … Named Most Valuable Player of the 2012 Kelly Cup Playoffs as he backstopped ECHL Florida to its first championship ... Led the Checkers in goals-against average (1.81), save percentage (.941) and shutouts (2) and tied for second in wins (10) in just 15 games played … Among goalies who played more than 10 games, led the Everblades in goals-against average (2.42) and save percentage (.920) … Started the season with the Everblades and made 33 saves in his ECHL debut, a 2-1 shootout loss vs. GWI on 10/15 … Recalled to Charlotte for the first time on 10/22 and reassigned to Florida on 11/2 after backing up five games for the Checkers … Picked up his first ECHL win and first professional shutout in a 22-save effort at SC (11/4) … Won four consecutive games from 11/4-11, stopping 108 of 113 shots (1.25 goals-against average, .958 save percentage with one shutout) … Recalled to Charlotte for the second time on 12/7 … Made his AHL season debut and stopped all 24 shots he faced over 42 minutes to pick up the win in relief of Mike Murphy vs. CHI (12/16) … Made a season-high 42 saves and saw his shutout bid spoiled with just 1:01 to play in a 2-1 win vs. SA (1/4) … Posted a shutout streak of 140:28, ranging from the second period of his AHL debut on 4/9/11 with Portland to Evgenii Dadonov's goal late in the third period on 1/4/12 … Made 26 saves to record his first career AHL shutout at ABB (1/20) … Stopped 92 of the first 93 shots he faced as a Checker, going 3-0-0 with a 0.37 goals-against average and .989 save percentage … Improved his all-time AHL record to 6-0-0 and his shootout record to 2-0 with a 29-save effort vs. RFD (1/26) … Won each of his first five starts with the Checkers from 12/16 to 1/26, posting a 1.26 goals-against average and .962 save percentage … Suffered his first AHL defeat in his seventh game vs. RFD (1/27) … Won three consecutive starts from 2/3 to 2/10, stopping 84 of 89 shots during that time to improve his Checkers record to 8-1-0 … Made 32 saves to record his second shutout in 11 games but lost 1-0 in the shootout at CHI (2/18) … Started 13 of 15 games from 1/20 to 2/25 … Reassigned to ECHL Florida on 2/29 and made 31 saves in a shootout loss vs. KAL later that day … Won three consecutive games from 3/10 to 3/16 and won four consecutive games from 3/18 to 3/24 … Won his last start of the regular season, improving his record to 9-3-0 (2.41 GAA, .916 SV%) since his last assignment from Charlotte … Won his first three professional playoff games as Florida swept Greenville in the first round ... Returned from injury to make 28 saves and post his first professional playoff shutout vs. KAL (5/2) ... Made 41 saves in Florida's Kelly Cup clinching, Game 5 overtime victory vs. LV (5/23). Joined Portland on an amateur tryout contract at the conclusion of his senior season at Boston College... Played one game for the Pirates, making 33 saves in regulation and overtime and stopping four of five shootout attempts in a 3-2 win at ALB (4/9). Led BC to NCAA National Championships in 2008 and 2010…Started all of Boston College's 81 games from 2007-09, posting a record of 43-25-13 with a 2.46 GAA and a .912 save percentage…Registered a 21-2 record in 23 career postseason contests, including 8-1 in NCAA Tournament play…Earned All-Tournament recognition at the NCAA Frozen Four and won Beanpot Most Valuable Player honors as a junior in 2009-10... Set Boston College single season record with 1,171 saves as a freshman.